Pets are allowed on leash only. They are not allowed on the beach area. They must not be left unattended and must be kept quiet. Owners must pick up after their pets. 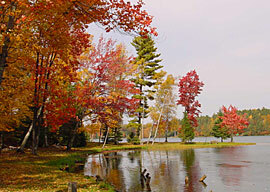 The use of air conditioners or electric heaters is not included in your camping fee. Contact the office for additional charges. 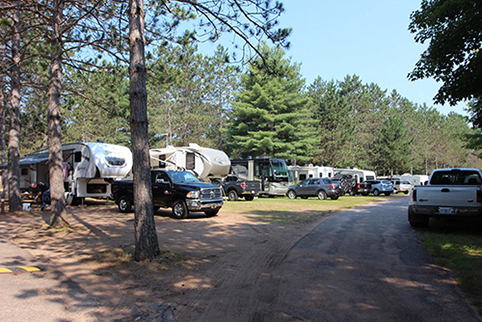 Only one RV per campsite and one vehicle per campsite. Please place trash and garbage in the Red dumpster located behind the rest rooms - also the recyclables in the correct barrels. No Clotheslines. Park rules forbid the tying of anything, dogs, clotheslines and etc. to trees. Positively no cutting of trees or driving of nails into trees. No Lifeguard on Duty on the beach. Clean up after yourself in the fish house. No fishing from swimming pier during daylight hours. Report any needed repair or hazard to the office. In case of emergency the attendant phone is equipped with 911. This is privately owned property. We reserve the right to select our clientele and visitors and will not be responsible for accidents or injuries to guests or visitors, or loss of money, jewelry or valuables of any kind.